Sam Tomkins struck the killer blow to the club he is joining next season, but life should have been easier for Wigan Warriors in this win. Having battled with 12 men for most of the match after a first half red card for Kenny Edwards, the Dragons were level before Tomkins’ relatively straightforward kick saved his side’s blushes - and second place in Super League. 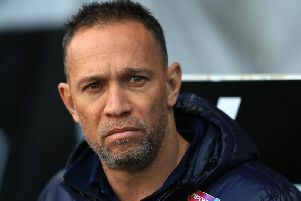 Catalans coach Steve McNamara rested seven of his stars with an eye on next weekend’s Challenge Cup semi-final against St Helens, with David Mead, Rémi Casty, Ben Garcia, Mika Simon, former Warrior Lewis Tierney, Benjamin Jullien and playmaker Josh Drinkwater not playing. And even with Wigan’s well-documented injury list, the carrot of finishing in second place - and playing a full half against 12 men - should have made this an easier game to call when mulling over the coupon. But the result and the two league points are what will matter when the Super 8s kick off, and this win means Castleford can’t overtake Wigan if they beat Widnes today - and Wigan will get four home games in the race to the play-offs. Warriors paid for a slow start when Jodie Broughton won the race to Tony Gigot’s grubber kick, which skipped past Liam Marshall, in the ninth minute to score the first try. Lucas Albert’s conversion nudged Catalans ahead, but Wigan didn’t have to wait long to claw back their deficit. They had few problems working their way to the Dragons’ line, and a Roadrunner-style kick chase from Sam Tomkins forced Gigot to concede a drop-out, building pressure and confidence in the Wigan ranks until they were over after 15 minutes with Chris Hankinson’s first try for the club. Starting his second match at right centre, Hankinson was first to a well-weighted kick from Tomkins to crash over and score, and full-back Tomkins had no trouble in adding the extras to level the score. But in truth the match was tough to watch. Not helped by a flat atmosphere in which the quiet was only pierced by referee Scott Mikalauskas’ whistle or odd moments of inspired play, it was difficult to see where the next score would come from either side. There was also concern for coach Shaun Wane when Tommy Leuluai and Hankinson clashed heads, both going off for concussion assessments. And with eight minutes to go until half time, the tone of the match was illustrated perfectly when Tomkins took a shot at goal instead of opting to run a penalty, though it did put his side 8-6 in front. The noise levels peaked though as the final minute of the first half ticked off on the clock. Warriors had enjoyed some of their most fluid attacking sets of the half in the minutes before the hooter, but a break was ended prematurely when Catalans’ Edwards decided the best way to stop it was by taking John Bateman’s head off - and he was also late in doing this. A red card for him followed the shoves and grabbed collars on the half-way line which had generated the most enthusiasm seen in the crowd to that point, and the timing couldn’t have been worse for the Dragons. The home side were visibly energised after the break - the combination of perhaps a stern talking to and the fact they were against 12 men probably helped as former Dragon Morgan Escare flew down the Boston Stand wing following a neat pass from Liam Marshall to score 57 seconds into the half. As the players walked back for Tomkins’ conversion, with which he had no problems in putting his side 14-6 up, it was possible to notice Leuluai had come back on the field from his concussion test, though the absence of Hankinson suggested he was finished for the evening. But Wigan’s revival continued, and Leuluai had a hand in the next try with a smooth pass to Bateman, who proved to the Dragons he can play on without a head by providing the set-up for Tomkins to go over from a typically slithering run. But they didn’t make it easy for themselves - and as the initial excitement of their throttle blips at the start of the second half wore off, the Dragons took advantage of the dip urgency. Arix Da Costa snuck over from dummy half in the 52nd minute, and it didn’t seem like much to worry about until Fouad Yaha caught Tom Davies out when the Wigan winger misjudged a kick in his own in goal. Albert’s goal brought the Dragons back to within two points, and we had a game on our hands once again just minutes after we thought Wigan were about to put it to bed. But Catalans’ cause, or their preparations for next week’s Challenge Cup semi-final, weren’t helped when Broughton left the field following a collision with a sponsor board behind his own in-goal. And the stoppages were frequent as the forecast rain - much welcome no doubt to gardeners with yellow lawns - started to teem down and grease the playing surface. The crowd took exception to a penalty given for a late challenge on Albert, after Escare had played on and made his way well upfield - and Albert took advantage to knock over the extras and lock the score. But Warriors kept their cool among the stoppages, and even though some would have thought it was early with eight minutes to go, Tomkins lined-up 10 metres out from the line and booted over the deciding drop-goal from in front of the posts. And there were sighs of relief as Joe Greenwood slid over in the final moments, though Tomkins’ missed conversion and a short kick-off attempt from Catalans led to one final tense moment before the hooter.